Make zucchini ribbons/noodles using a vegetable peeler. Repeatedly run the vegetable peeler lengthwise down the zucchini to create long ribbons. Heat a skillet over medium heat. Once heated, add the pine nuts and toast, stirring occasionally, for 5 minutes or until lightly browned. Remove from skillet and set aside. Add avocado oil to the same skillet and increase to medium-high heat. Once heated, add a handful of zucchini noodles and cook for 3-5 minutes, tossing frequently with kitchen tongs. 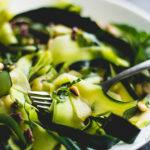 Work in batches – adding too many zucchini noodles at once will cause the zucchini to steam, release moisture, and get soggy. You only need to add enough zucchini noodles to cover the bottom of the skillet. Add cooked zucchini noodles to a large bowl. Once all the zucchini noodles are done, toss in the toasted pine nuts, basil, and kalamata olives. Serve immediately! I often skip “ribboning” the center of the zucchini because it’s too soft. Instead, I’ll chop it up and add it to salads or roast it with olive oil.